« Organic Food: Luxury or Necessity? Recently, my Mom read that passing down cookbooks from mother to daughter is a way of preserving a family’s history. So in that vein, she gifted me with two cookbooks that my grandmother received as wedding presents in the 1940s: The Settlement Cookbook and the Watkins Salad Book. Deviled eggs are a food I always associate with summer cookouts. So with the Fourth of July right around the corner, I thought I’d share with you my family’s recipe. I hard-boil my eggs according to Martha Stewart’s instructions, which I’ve found to be the best. 1. Slice the eggs in half and scoop out the yolks. Place the yolks in a bowl. 2. Mash up the yolks with seasonings, vinegar, butter and just enough mayonnaise to moisten. Season to taste–I did not have ground red pepper, so I used Cayenne pepper, which was equally as good. Mix in diced sweet pickles. 3. Refill egg whites using a spoon or pastry bag. Sprinkle with paprika and chill. 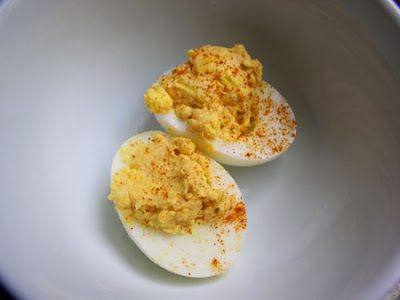 For more on deviled eggs, including history and recipes, visit The Deviled Egg Gourmet.